Here are some of my most beloved books that sit on my bookshelf. 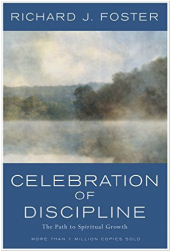 A straightforward, inspiring guide to spiritual practices and disciplines. A classic on spiritual formation. An exploration of courage, and the paradox that true strength is birthed out of vulnerability. A great book for people who long to develop a conversational relationship with God. This book invites you to step out of distraction and noise, and meet God more deeply. We are created to live life as God's beloved. A powerful read on our true identity in him. A practical and insightful book on being listeners - with God, ourselves, and others. A discovery of what our souls are, why they matter, and how we can keep them healthy. A book that examines life, transformation, and how to practically live spiritually fruitful lives. ​Links take you directly to Amazon, and I earn a small commission (at no extra cost to you) that helps keep this site going. For other useful products for the creative, joy-filled life, visit my curated Shop page.